Oval-8 Finger Splints – We’ve Made the Best Even Better! 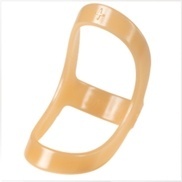 It’s no secret that Oval-8 Finger Splints are the preferred finger orthosis to treat your patient’s mallet finger, swan neck and boutonniere deformities, trigger finger and trigger thumb, lateral deviation, fractures, arthritis, and hypermobility (EDS). We are excited to announce improvements to the Oval-8 that make it easier on your eyes and even more comfortable on your patient’s fingers!